This is my absolute favorite cologne that my husband wears! Whenever he wears this, I cannot keep my hands off him. It smells so light and clean. Wear this men's eau de toilette spray to the office or out on a date to draw attention with its citrus and fruity fragrance notes. This spray comes in a 6.8-ounce bottle, which provides a plentiful amount even with daily use. This is the best men's cologne I have ever smelled. I don't want to exaggerate, but I can spot this cologne anytime and any where. It has a very crisp scent, that attracts me. I have bought this for my boyfriends and brother. They all seem to love it. I bought Loris Azzaro Chrome Men's 3.3-ounce Eau de Toilette Spray as a gift for my son.He loves it, It smells great and a great price, will buy again. 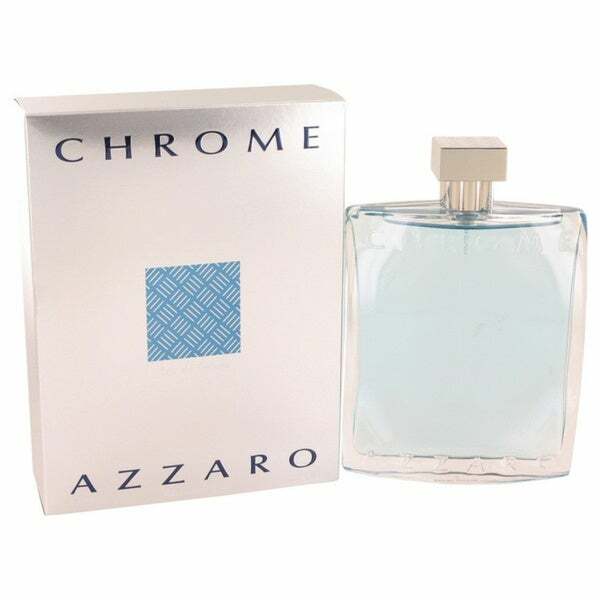 I have purchased and worn the Azzaro Chrome Men's Eau de Toilette Spray as many times and always get compliments from the ladies. I love it and is reasonably priced to buy again and again. The chrome Eau de Toilete Spray is a refreshing fragrance results from wearing it are always complimentary from all who detect it when I am out. OK FIRST OFF NEVER ASK A GUY FRIEND TO GIVE YOU ADVICE ABOUT WHAT TO WEAR AS FAR AS FRANGRANCE ( THERE'S JUST NO WAY TO DO THAT AND REMAIN MANLY, AND THEY WONT KNOW ANYWAYS TRUST ME ) THAT BEING SAID I ASKED SEVERAL CLASSY LADIES, ( I'M TALKING THE KIND THAT YOU COULD NEVER GET WITH, BUT WISH YOU COULD ) WHAT THIER FAVORITE FRAGRANCE ON A MAN IS, TRUST ME YOU WILL BE SUPRISED BECAUSE IT WONT BE THE MOST EXPENSIVE OUT THERE ( A TOTAL GAFF PERPETRATED ON MEN BY THE INDUSTRY BTW ) SO BACK TO CLASSY WOMEN AND CHROME I ASKED AT LEAST 6 RIDICULOUSLY HOT HIGH END WOMEN WHAT THIER FAVORITE WAS, THEY ALL SAID THE ORIGINAL CK ONE- OR CHROME! THERE YOU HAVE IT RIDICULOUSLY HOT WOMEN THAT YOU COULD NEVER GET WITH LIKE CHROME HENCE I BUY CHROME! This is my husbands favorite cologne and to find the large bottle for such a great price seems unreal but it's true you get a 6 ounce bottle for the cost of a 3.4 ounce at any other place. My boyfriend loves this perfume and the bottle is the large size. Smells clean and citrus like. Highly recommend. I purchased this fragrance for my son's birthday and he loves it! It is a fresh, crisp fragrance for a man and one that is appropriate for day and evening...he was very happy to get the larger bottle too . A classic fragrance for any man - superb! I gave this to my husband for Xmas,and every time he use it you only smell it when he spray it and about a hour later there is no scent at all it's like its flavor water. Smells awesome! The sent last for hours. Smells so clean and fresh! One of my favorites! Bought this as a gift, it is my favorite scent of mens' colonge and suggest everyone try it as I've given out many times and it smells the same on each man who has used it (which is not always the case) Sephoria charges the same price for a bottle half the size 3.4oz it is rare to ever find bottles larger than 3.4. My son-in-law loves this! Great size on the bottle! It was the right size & brand new. Loved it!!!! Chrome Azzaro is the best cologne a man could ask for. Smells great and not to strong at all but stays on for a long period of time. "Why does it say it is 6.8 ounce? Because the picture shows as a 3.4 ounce." For the price you will receive the 6.8 ounce.